Everyone attends a lot of meetings, for decision making and/or performance reporting. Whatever the purpose, there are lots of meetings; something on the order of 55 million a day. If you’re a manager, you’re likely averaging 12 meetings per week for about 1-hour each meeting. It’d be great if all those meetings were entertaining, engaging, and at least effective. But many aren’t. For example, 11% of attendees think meetings are ineffective and another 18% think they’re somewhat effective/ineffective. Even if you’re in the majority of attendees who think meetings work, some parts of those meetings are more sleep inducing than industrial strength Ambien. But you can’t sleep through the mandatory meetings, so you hold your phone out of sight under the conference table while responding to emails and texts. No wonder there’s meeting fatigue. NOTE: There are many conflicting numbers and infographics of the number of daily meetings and their effectiveness. For a look into the accuracy of some of these numbers, here’s a great article: 55 Million: A Fresh Look at the Number, Effectiveness, and Cost of Meetings in the U.S. So there are many boring meetings. What does it really matter whether the meetings are boring because there’s lots of them, or just because some meetings are boring? 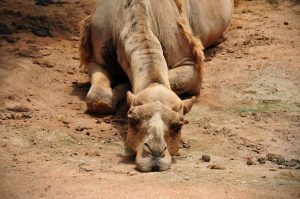 Unfortunately, meeting fatigue plus boredom kills performance reporting. In those meetings (quarterly, semi-annual, or annual), corporate departments report performance to one another. And they’re DOA when that big snooze kicks in. Organizational peers play a significant part in the success of any support department. For example, peer managers of Procurement, Real Estate/Workplace, etc., have a significant impact on a corporate security programs’ effectiveness. However, when peer managers are inattentive or uninterested during report outs, enterprise-wide success suffers. Without their support, departments’ programs can languish, or never get off the ground. The goal is to gain peers’ attention, engage them emotionally and hold their interest during report outs — to gain and keep “top of mind” awareness of a department’s contributions and importance. Although the end of the first generation of performance reporting may not be over (too many Death by PowerPoint still around), we can at least see the next generation from here. And the next generation looks like…Edutainment. That’s right, edutainment for performance reporting. Instead of giving you a hypothetical example, how about a proven, award-winning example? Here it is. A client of mine, Greg Jodry, formerly Yahoo’s Senior Director of Global Security and Safety (GSS), won a CSO50 Awards for 2018 for edutainment performance reporting. The award is described as recognizing “…50 security projects that demonstrate outstanding thought leadership and business value.” After Verizon’s acquisition of Yahoo finalized this year and corporate Yahoo disappeared, Greg took the exit package. In the three years before then at Yahoo, Greg and I produced edutainment type presentations that reported GSS’ performance, generated excitement about security, and created anticipation to see the next corporate security presentation months later. Just a bit of a sad side note: Today you won’t find Yahoo in the list of CSO50 Awards for 2018 because, as we were to find out after being notified of winning, the award is only given to companies, not individuals or departments. And since corporate Yahoo no longer existed, the award was withdrawn. C’est la vie. But for an example of nextgen performance reporting, the Yahoo GSS examples deliver. So, here is the information pulled from our application for the CSO50 Awards 2018. Yahoo’s Global Security and Safety (GSS) was one of several orgs that reported out to its peer managers several times a year during multiple day-long, off-site meetings. These sessions were necessary data dumps to inform, and more importantly engage peer orgs in the participation and support of enterprise wide programs. GSS’ Senior Director, Greg Jodry, recognized the mind numbing amount of information that he and other managers had to sit through. In every case, information was presented in PowerPoint slideshows; and depending on the time of day it was presented, such as after lunch or at the end of the day, the information was met with glazed eyes and subsequently ignored after the meetings. GSS required a more enthusiastic reception of its reports to ensure its programs gained the attention and support they needed across the groups. And this needed to be accomplished within a 30-minute time slot. Starting with the November 2015 meeting, Greg introduced a Star Wars themed presentation of GSS performance — Star Wars: Episode VII was being heavily advertised at the time, just prior to its December release. In subsequent meetings GSS report outs included a mobster themed presentation followed by a comedian themed presentation. 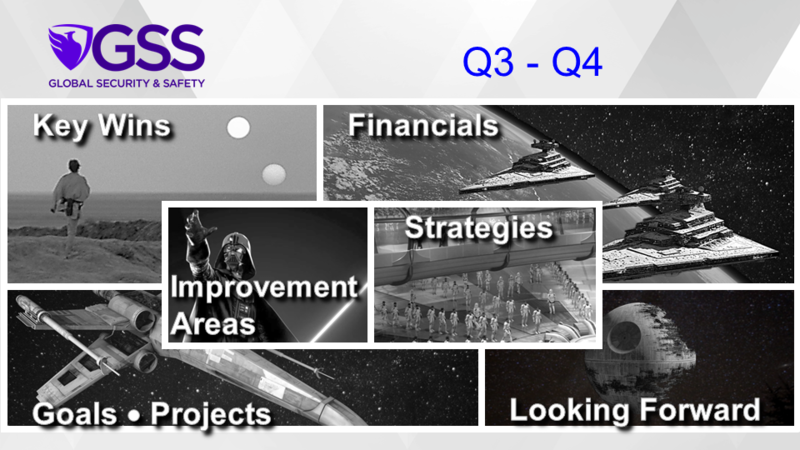 The GSS project’s innovation was its “edutainment” approach to raising leadership’s appreciation of security contributions while reinforcing Yahoo’s corporate value of fun. 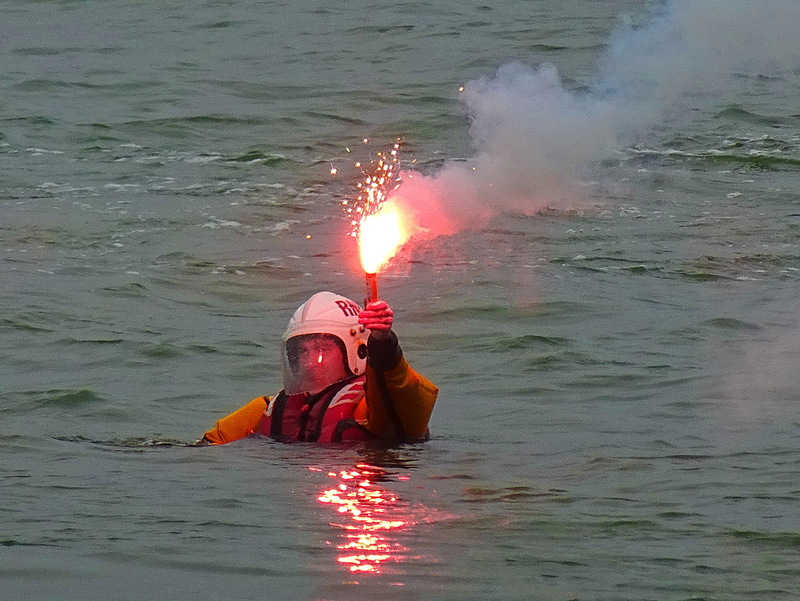 GSS presentation slideshows were educational in nature and themed as entertainment even though they addressed serious topics, such as life safety, business continuity, and asset protection. In each presentation, themes were introduced in an opening sequence of animated images, movie soundtracks, sound effects, and dialog clips. After the opening, individual sections were presented in a subset of the overall theme. In the opening sequence of the Star Wars’ deck, GSS’ departmental strategy is described in scrolling text over star filled background of deep space with movie soundtrack playing; mirroring the original Star Wars movie’s opening sequence. The opening text showed how GSS’ strategy was intertwined with the Yahoo CEO’s vision. 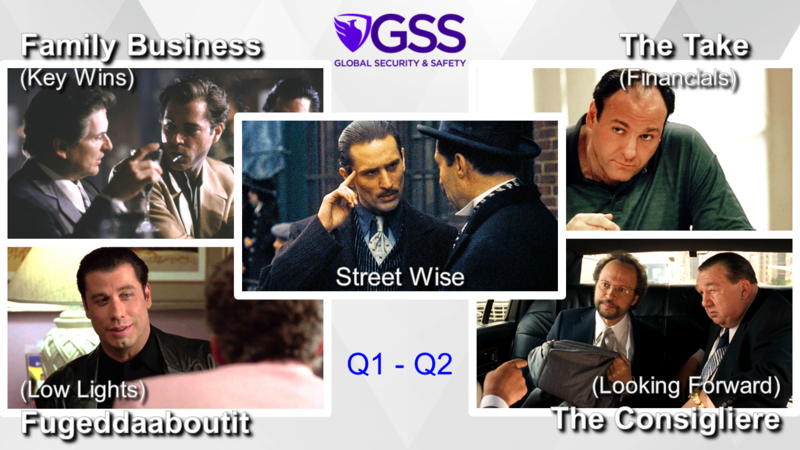 In the Mobsters’ themed deck, the Low Lights topic (Fugeddaaboutit) setup GSS’ honest self-assessment of where it could have done better. The Low Lights topic began with the movie Get Shorty. Multiple images of the characters Chili Palmer (played by John Travolta) and Ray “Bones” Barboni (played by Dennis Farina) built across the screen while dialog of a short scene between the two characters played over the movie’s soundtrack. 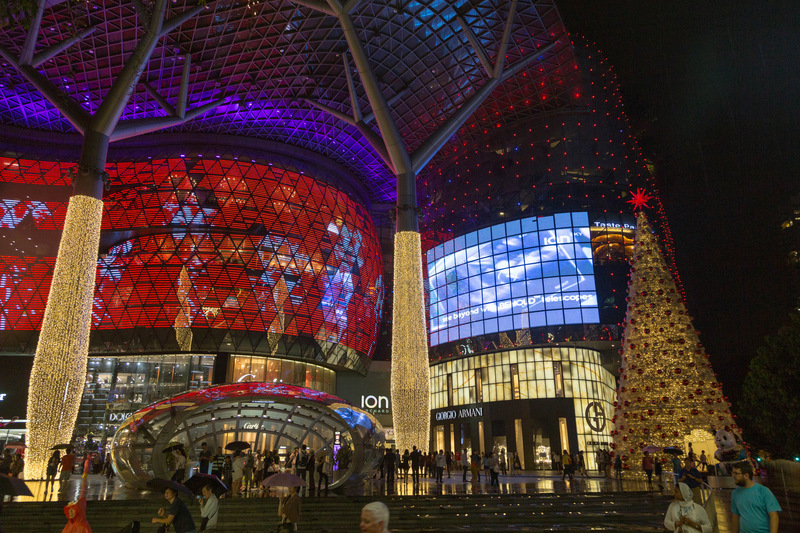 This layered 15-second opening was followed by the GSS Low Lights’ content on a separate slide. In the Comedians’ themed deck, presented at the time Yahoo was in its sale process, opened with the “Who’s on First” routine by Abbott and Costello. It spoke to the uncertainty and wait-and-see attitude with a sense of humor. 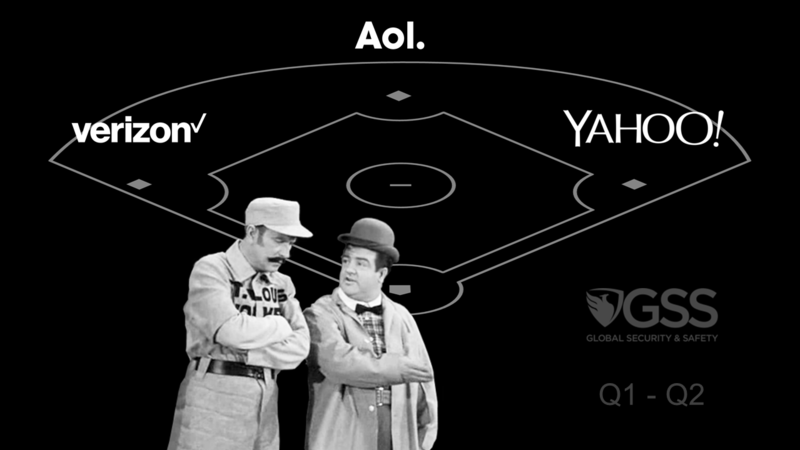 The Abbott and Costello voice over played with animation of still images, while the logos of the Yahoo acquisition moved around the bases in sync with the dialog. All presentations were created in Microsoft PowerPoint (wide screen 16:9 format) for ease of last minute revisions, and to comply with the larger group’s presentation requirements. There are likely many ways to cure the Performance Reporting Blues. Edutainment is just one of them, and it sure banishes boredom in the gazillion meetings we all must endure. It’s just a whole lot more fun. Asks: Anything needed from peers?